At GEI Works, we understand the importance of dewatering and providing solutions that work. Our Geotextile Dewatering Tubes are designed for dependable performance in dewatering mining tailings and mineral processing. The geotextile tubes are well made, durable, and are available in custom or standard sizes to suit your mine dewatering and mineral processing needs. Questions? Call the GEI Works team and ask about our geotextile dewatering tubes at 1-772-646-0597 or request pricing. Geotextile Tubes by GEI works are a much lower capital expense and are a more flexible option over that of traditional engineered impoundment storage facilities used in mineral processing and mining operations. Mine dewatering can help keep you in compliance. Geotextile dewatering tubes work in concert with your other processes to help keep your mining site in compliance, as an effective means of filtering out potential environmental hazards from the waste water produced in the mining process. With this dewatering method, our geotextile tubes provide greater flexibility in managing the storage space needed to maintain uninterrupted mining operations. Contained neatly within the geotextile tube, additional processing or salvage operations for mining tailings is convenient. Mine dewatering processes can also support water resource management efforts. Effluent (clear water) that is produced from dewatering mine trailings can be captured and reused again and again in the mining process. After dewatering, mining trailings are automatically packaged up neatly within the geotextile tubes, the tubes can be stored safely on-site, transported to landfills, or placed strategically to provide structure and support for dams, dykes, or sloped terrain. Step 1: Identify the best location for your GEI Works Geotextile Tube. Consider the lay of the land, and settle on a relatively flat area, as tubes placed on inclines can be unstable and risk damage to personnel and equipment. If planning to relocate the tube once filled, plan up front for how you'll access the geotextile dewatering tube for loading and transportation. Step 2: Install the Geotextile Dewatering Tubes, following specifications and GEI Works Installation Instructions (PDF). Note: Should you need on-site assistance, we have a mobile team that's available world-wide to assist in the installation of our Geotextile Dewatering Tubes for mine dewatering. Step 4: The dewatering process will start immediately once the process water enters the tube, with clear water (effluent) seeping through the pours of the geotextile tube's fabric. Further add to your job site efficiency by capturing the effluent and reusing it in the mining process. We recommend using a secondary containment berm by GEI Works to conveniently capture the clear water for reuse. Step 5: Monitor the tube periodically to prevent overfilling. Once the geotextile tube has reached capacity, it should be disconnected, with mining dewatering operations moving to the next tube. The full tube should be left in place until fully drained and the solids are dry. For assistance with specifications, product options, custom solutions, dewatering methods, or pricing for dewatering mining tailings and mineral processing operations, please contact us! We're here to help. For smaller scale operations, we also manufacture a wide selection of dewatering bags and socks. 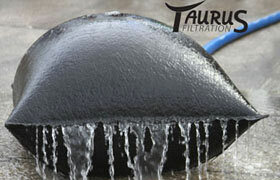 Dewatering solutions for coal mining are also available.